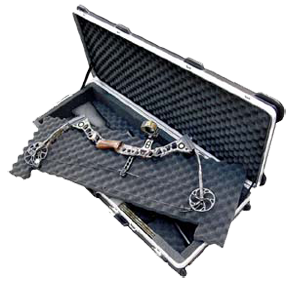 The Parallel Limb Bow Case has heavy-duty field replaceable locking latches, a spring-loaded end handle for comfortable towing and protection from damage, molded-in bumper protection to maximize impact resistance and quiet glide heavy duty wheels for easy transport. Secure "tie-down" loops for ATV transport are an added feature and stylish embossing that actually adds structural support to the lid. This innovative new case has all of the features that SKB's cases are noted for and then some.